Aluminum extrusion design is an initial procedure before extruding the product. Our engineer will review your profile design to make sure if it can be extruded. Then we need to understand its end users to choose the appropriate aluminum alloy. It is necessary that you can tell us if the extrusion will assemble with other products. If yes, our engineer will mark important tolerance. Besides, it still has other theory parameters that will lead to aluminum extrusion profile design. When receiving a new design from our customer, firstly our engineer will calculate the circumscribed circle diameter (CCD) to make extrusion mold. According to the mold size, we decide to use an appropriate extrusion machine. Then we will check the wall thickness and detail shape of the new design to verify extrudability. Different mechanical properties should be choose suited Alloy No. and temper. If it is decorative final usage that requires much higher level on appearance surface, then 6063 Alloy is the best choice, on the contrary, if your desire higher mechanical properties that should be used in structural final usage, 6061 alloy is better than 6063. Wellste produce extrusion profile almost reach 80% is adopted 6000 series alloy, but we also can produce 1000 series alloy, 2000 series alloy,3000 series alloy,5000 series alloy,7000 series alloy meet your vast requirements. Wellste designer will optimum cost-efficiency to satisfy product’s structural strength, normally, uniform wall thickness aluminum extrusions are more easy to produce, but sometimes, the varied wall thickness is allowed if it is necessary. Extrusion force and speed also affect wall thickness design, as well as the alloy No. selected, the shape of aluminum extrusion, the mechanical properties. Wellste will strictly comply with China Aluminum Extrusion Industry, and the standard dimensional tolerance for architecture and building construction is followed GB5237.1-2008, the standard dimensional tolerance for general engineering industry is followed by GB/T 14846-2008. If some dimension is very critical and requires tighter than China standard dimension tolerance, please contact wellste engineering designer to help you make further discussion. What kind of surface finish is selected? That depends on the final usage of your products. Wellste has a various surface treatment to meet your different requirement. Anodized and electrophoresis is very popular in decorative Home material and construction, Powder coating’s advantage that is its rich colors, wellste also supply higher-level coating come in PVDF(Fluorocarbon spraying) if you have special inquire on resistance to fade after long time sun’s ultraviolet rays. 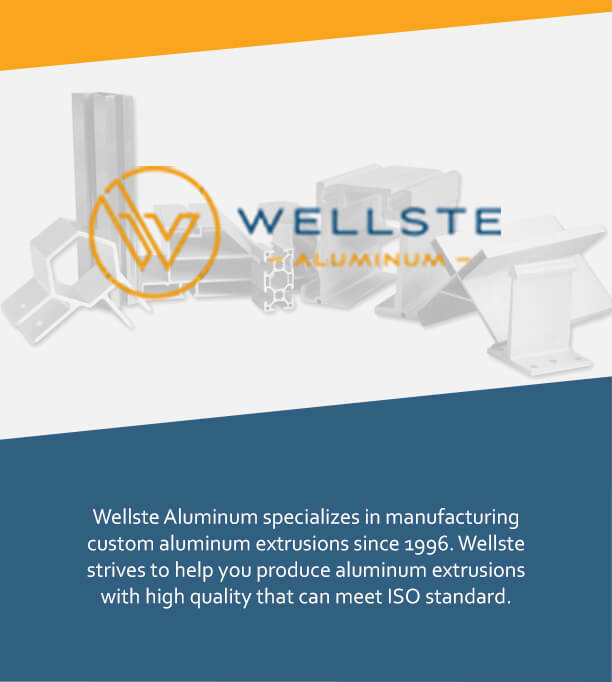 Wellste manufacture and supply aluminum extrusion profiles for more than 20 years. With 15,0000 square meter production workshop, our annual production capability reaches 10,0000 ton. 30 engineers 10 years of aluminum industry working experience serve you the best service. Wellste welcome customized and OEM. If you do not have CAD drawing. You can send us a PDF file with detail specifications. Our engineer will make a CAD drawing according to the detail data. Or you can send a sample that our engineer will measure manual with our advanced equipment and make drawing for you, If you cannot provide enough information, our experienced engineer will assist with your design and create your product. 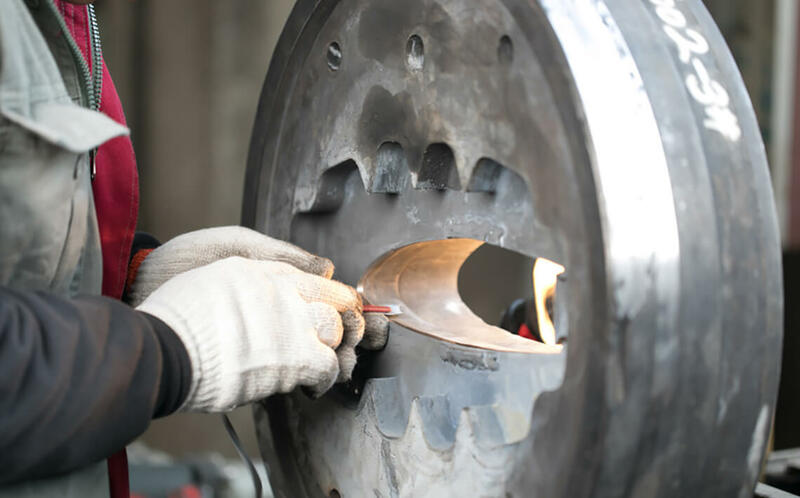 To save your time, Wellste provides one-stop aluminum fabrication. CNC machining, punching, tapping, milling and welding etc all can be realized in Wellste. Contact us today and you will get fast free quotation within 8 hours.